November 10, 2018. New Delhi, India – This morning in New Delhi, Jack Dorsey, co-founder and CEO of Twitter came to meet His Holiness the Dalai Lama. He thanked His Holiness for using Twitter. 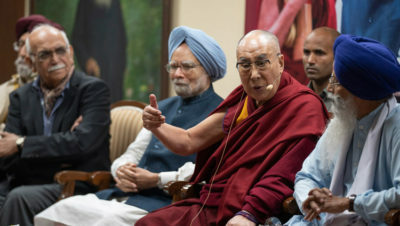 His Holiness spoke to him extensively about historic links between India and Tibet, India’s exemplary tradition of religious harmony and the importance of recognising the oneness of humanity. When Dorsey asked what would have the most impact on bringing religious traditions together, His Holiness replied that in general expressing affection and respect is what brings people together in most situations. On the steps of the Bhai Vir Singh Sahitya Sadan (BVSSS), His Holiness was welcomed by the Director, Dr Mohinder Singh and the President, former Prime Minister, Dr Manmohan Singh, with the gift of a sapling. They then escorted him to the stage inside. BVSSS is an institution established 60 years ago to commemorate and further the work of Bhai Vir Singh, a poet, scholar, and theologian of the Sikh revival. Today, it was the focus of the inaugural event of a year-long celebration of the 550th anniversary of the birth of the founder of Sikhism, Guru Nanak. Proceedings began with the singing of a Praise to Guru Nanak by Sdn Taranjit Kaur. Dr Mohinder Singh, host of the occasion, recalled Guru Nanak’s advice to observe the unity of humanity and overcome divisiveness. He also based his inter-religious dialogue on an ability to listen to others with an open mind. His Holiness was formally welcomed with the gift of a maroon shawl and a framed copy of the Mul Mantra, the first composition uttered by Guru Nanak Dev upon enlightenment, done in gold leaf. The keynote speaker, eminent art historian, BN Goswamy gave an erudite account of Guru Nanak who he compared to the legendary Simorgh of the poet Attar of Nishapur’s literary masterpiece, the ‘Conference of the Birds’. He noted how much Guru Nanak emphasized the importance of truth when he said that truth never grows old, truth survives and truth brings illumination. After pointing out that there are no known contemporary portraits of Guru Nanak, Goswamy described and explained a series of drawings and paintings displayed on screens before the audience showing various aspects of the Guru’s life. He drew particular attention to a painting which depicted him wearing a robe inscribed with quotations from scriptures of various faiths, revealing his respect for them all. He told a story of Guru Nanak’s being rebuked during his pilgrimage to Mecca for sleeping with his feet pointed at the Kaaba, and his retort, “Show me anywhere where my feet will not be pointed towards God”. His Holiness and Dr Manmohan Singh were next invited to honour a number of spiritual leaders among the guests with a gift. They included Dr Inderjit Kaur, Sant Balbir Singh Seechewal, Swami Gurdip Giri, Acharya Shrivasta Goswami, Pir Kwaja Syed Nizami and Sir Mark Tully. Invited to make his remarks, His Holiness began by saluting his respected friend and former Prime Minister, Dr Manmohan Singh, his spiritual brothers and sisters and other brothers and sisters in the audience. “It’s a great honour for me to be here for the inauguration of this year-long celebration of the 550th anniversary of Guru Nanak’s birth. Although I don’t know all the details of his life, I have great admiration for Guru Nanak. I am particularly impressed that someone from a Hindu background like his made a pilgrimage to Mecca to express his respect for another religious tradition. This reflects the longstanding Indian tradition of different religions living together in harmony. “Common to several Indian spiritual traditions are the practices of cultivating a single-pointed, calmly abiding mind (shamatha) and the insights derived from analytical meditation (vipashyana). These practices have led to a cumulative understanding of the workings of the mind and emotions leading to their transformation and the achievement of peace of mind—inner peace. This is a key part of the legacy of Indian civilization and Guru Nanak, like Mahavira and the Buddha before him was a product of such Indian tradition. “What’s worse is that although we’re enjoying peace here, in Syria and Afghanistan people are killing each other in the name of religion, children are starving in places like Yemen and the gap between rich and poor grows ever larger. When our human brothers and sisters are suffering in this way, how can we remain indifferent? 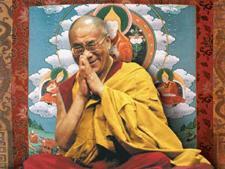 “The root of the problem is a lack karuna or compassion. Whether or not there is a God as some religions believe, what human beings do is important. And the quality of what they do depends on their motivation, which is why we have to learn how to cultivate a compassionate mind. This is why religions with their message of karuna and ahimsa, compassion and non-violence, is so important. It’s also why mutual respect among our various spiritual traditions is crucial too. “Fortunately, religious harmony continues to flourish in modern India. Look at the Parsees, descendants of the Zoroastrians from Persia, in Bombay. There are fewer than 100,000 of them among millions of Hindus, Muslims and Christians, yet they live in peace without fear—that’s India. I believe India should make more of this and show the rest of the world that different religions can live amicably, in harmony, side by side. “So religion remains relevant today. Whether there is a God or no god, a next life or no next life, liberation, moksha, or not—and you,” indicating Prof BN Goswamy, “mentioned truth, which is a difficult word to define, despite their different philosophical views, all our religious traditions talk about love. Modern India should pay more attention to the ancient Indian knowledge of the workings of the mind and emotions with its advice about tackling destructive emotions and achieving a kind of emotional hygiene. In his remarks Dr Manmohan Singh expressed gratitude to His Holiness for his inspiring talk. He also thanked Prof BN Goswamy for his speech, remarking that the two of them have been friends since they studied together in Amritsar when they were young. He looked forward to further meetings with sisters and brothers of other faiths and a series of lectures about different aspects of Guru Nanak’s life and legacy, the proceedings of which will be published in due course. He told a story from Guru Nanak’s youth when his father gave him a sum of money with which to do business. Instead he used it to buy food that he offered to sadhus. Thus began the tradition of the langar, providing food for all without distinction. He suggested there is a need for such an innovative approach to our relations today based on truth, gender equality and universal responsibility. Attention moved to a marquee in the grounds that contained an art exhibition dedicated to Guru Nanak. Accompanied by the other spiritual leaders among the guests and concerned artists, His Holiness cut a ribbon to launch the exhibition. As he viewed the works displayed, Prof BN Goswamy stepped in to explain several pictures. Finally, His Holiness and Dr Manmohan Singh together planted a sapling that Dr Mohinder Singh said the BVSSS pledged to nurture.